shores of Future Soundz followinga visit to the musical homeland of Jamaica. With a whole heap of new Dubplates and inspiration we welcome the crew back to Mojo's in fine stlye. Also on the bill is DJ RastaFyah spinning a fine selection of all things Reggae and Dancehall to get your feet moving. DJ Sorted will be playing fresh from a trip to Barcelona for a 7 day Reggae festival and he will also befull of fresh tunes and inspiration…………….di original geeza!!!!! Last but not least your regulars and hosts EarthLink Sound with selectors Drummie and Kritical providing the canvas for the Dub Master Sheriff Lindo to work his magic………………….there is a heap of fresh new reggae to be rinsed and enjoyed fi real!!!!! 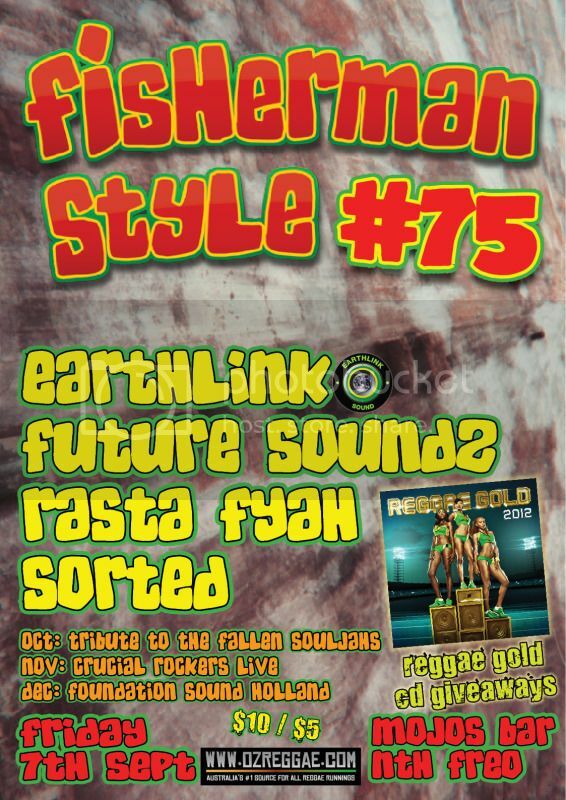 This is sure to be a another big night of nice vibes fi real……………Giveaways on the night of the new REGGAEGOLD 2012 CD. Big up everyone that rolled out, the place was packed & vibes was at an alltime high.